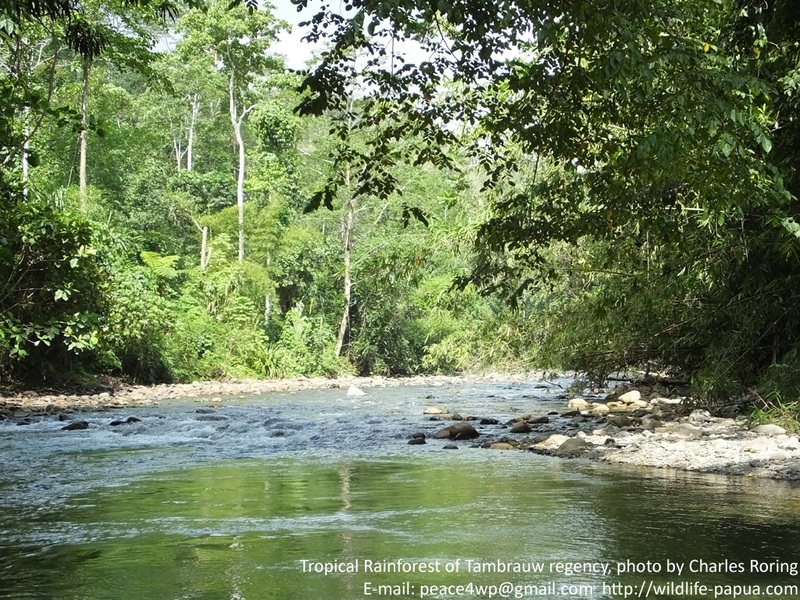 Klasow valley is located in the east of Sorong town. It has been a favorite travel destinations for visitors who are interested in taking a jungle tour as an extension from their trip to Raja Ampat. 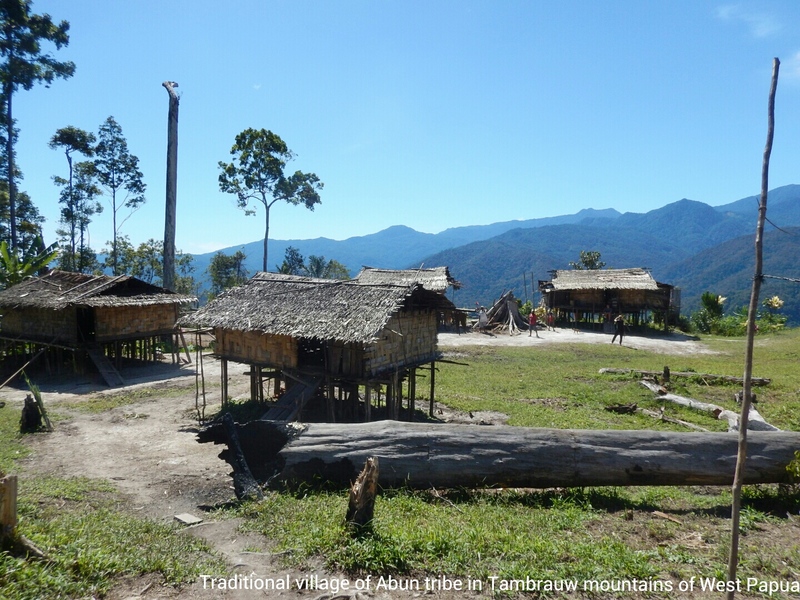 It takes approximately 1.5 hours to reach the valley by a 4WD car and 2 hours on foot to reach the guesthouse that is in the middle of the jungle. Early this month, I guided 2 visitors from the United States. They were father and daughter Indian American visitors who wanted to see birds of paradise. We went to the valley. 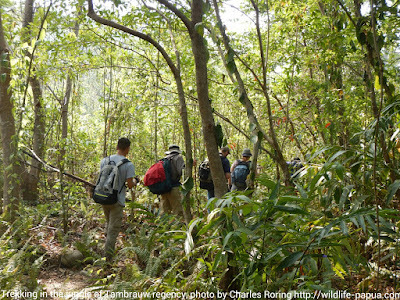 We spent 3 days/ 2 nights exploring the lowland rainforest to see its birds, wallaby, and plants. We stayed in Malagufuk village. Klasow valley has been a preferred rainforest tour destination in Sorong regency for visitors who return from Raja Ampat. 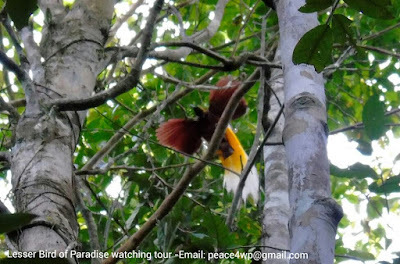 During the trip to the valley, we were able to see Lesser Birds of Paradise, Twelve Wired Birds of Paradise, Sulphur Crested Cockatoo, Blyth's hornbill, Spotted Goshawk, Golden Myna and other tropical birds that make Klasow as their natural habitat. Accompanied by some local guides, we were able to spot some Wallabies in the jungle near during a night walk. After completing this land tour, they continued their trip to Raja Ampat islands where they would stay in Papua Paradise Eco Resort. 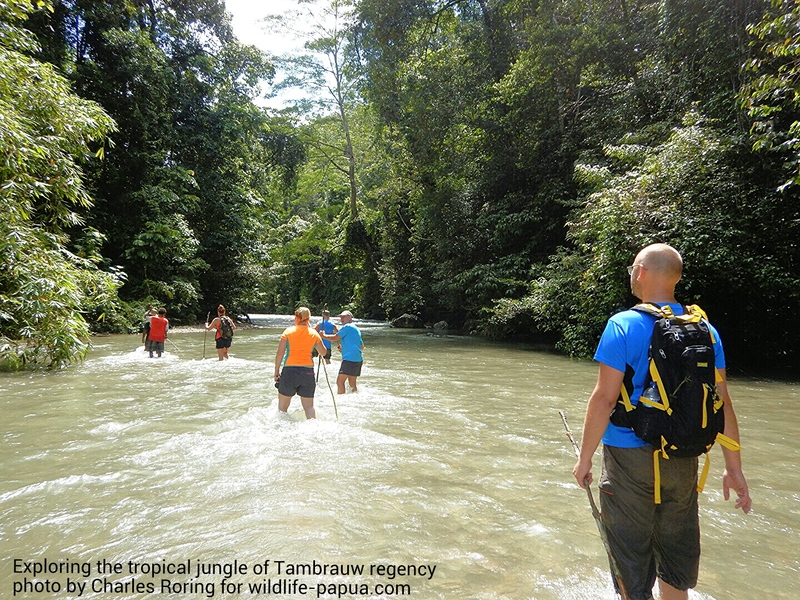 Rainforest tour in the valley can be done all year round for visitors who are interested in seeing the wildlife and tropical plants of West Papua. Day 1 Pick up in Sorong city, walking through the rainforest to reach the jungle village. Day 3 Walking back to the main road, we still have the chance to watch wild birds, tropical plants and butterfly along the way, transfer to Sorong city by 4wd car. A customized itinerary can be prepared upon request. Your tour can also be extended to Raja Ampat where you will be able to see coral reef and tropical fish of the best marine environment in the world. As of 2011 counting, Raja Ampat, according to marine biologists has got the highest marine bio-diversity on earth with 1,427 reef fish, 553 hard corals, and 42 mantis shrimp. When you take the snorkeling tour with us, we will leave Sorong city in the morning for Raja Ampat islands. We will stay there for 5 days/ 4 nights to enjoy snorkeling in Kri island, Mansuar island, Arborek, Kabui bay, Manta Point, Pianemo post and Five Rocks (Batu Lima). Traveling to Kabui karst islets (snorkeling) and a visit to its passage. The above itinerary should be considered as a reference only. It can be changed or modified during the trip depending on weather condition (rainy or sunny days, wave and sea current). Please, contact me (Charles Roring) by email to: peace4wp@gmail.com if you are interested in taking a rainforest tour in Sorong regency. I have just returned from the jungle of Tambrauw mountains after organizing a tour for 6 Polish visitors who wanted to see tropical rainforest. They spent 2 weeks of their vacation period scuba diving in Raja Ampat and walking in the jungle of Tambrauw. While in Raja Ampat, they stayed in comfortable bungalows of Kri Eco Resort. In the contrary, when they went into the jungle, they had to stay in dome tents battered by heavy rain. 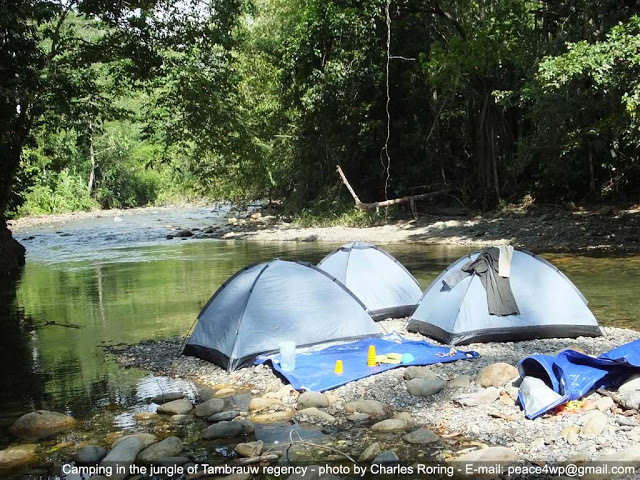 We went trekking and camping at the bank of Syugrar river (approx. 4 hours by 4WD car). During the tour, we saw various species of birds including lesser birds of paradise, sulphur crested cockatoo, blyth's hornbill, deer, wild pigs, cuscus possum, beetles, butterflies, and a lot of species of plants. We built tents and stayed in the jungle for 4 days/ 3 nights. We did day and night walks in the jungle. As a tour guide, I provided several dome tents for them. We also had a riverwalk where we explored the forest by walking through Syugrar river. Its current was not so strong so we could walk against it. If you are visiting West Papua (Sorong town and Raja Ampat) and want to combine your trip with jungle tour, please, contact me (Charles Roring) by email to: peace4wp@gmail.com. Tambrauw regency is located in the bird's head (vogelkop) region of West Papua province of New Guinea island. The capital is Fef but at the moment all of the government activities are concentrated in Sausapor. It is a small town (located in the northern coast of the island. Visitors who want to watch tropical birds can come to Tambrauw regency. There are a lot of species of birds in the region including kingfishers, blackbutcher bird, sulphur crested cockatoo, palm cockatoo, blyth's hornbill, rainbow lorikeet, brahminy kite, pinon imperial pigeon, yellow faced myna, egret, black capped lory and many more. 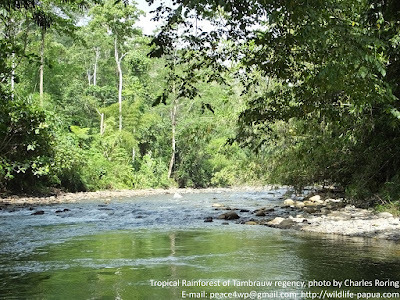 We can explore the forest and rivers near Sausapor town to see the birds. Tambrauw mountains have got a lot of birdwatching sites that are highly recommended for avid birders. These sites are located both along the coastal and mountainous regions. Coastal areas that are good for birding are the banks of Syuan river. For highland birding, my recommendation is Ases Valley. From my personal experience of birding in the pristine forest of Tambrauw, the birds population and varieties are higher than in other forest locations that are close to towns. Visitors can see western crowned pigeon, pigeon, cockatoo, fruit doves, hornbills, and even several species of birds of paradise. Most of the landmass of the regency is mountainous region. So, birding in different elevation of the mountains will bring different species of birds that can be watched. For instance, if we go to the coastal area, we will watch Bridled Tern (Sterna anaethetus), Sootty tern (Sterna fuscata). But if we go to higher elevation, we may see such birds as Papuan Lorikeet (Charmosyna papou). Tambrauw mountains are located between Manokwari and Sorong regencies. But the easiest way to reach the mountains is by chartering a 4WD car from Sorong city. So, I highly recommend to birdwatchers that they fly to Sorong city to go birding in Tambrauw. 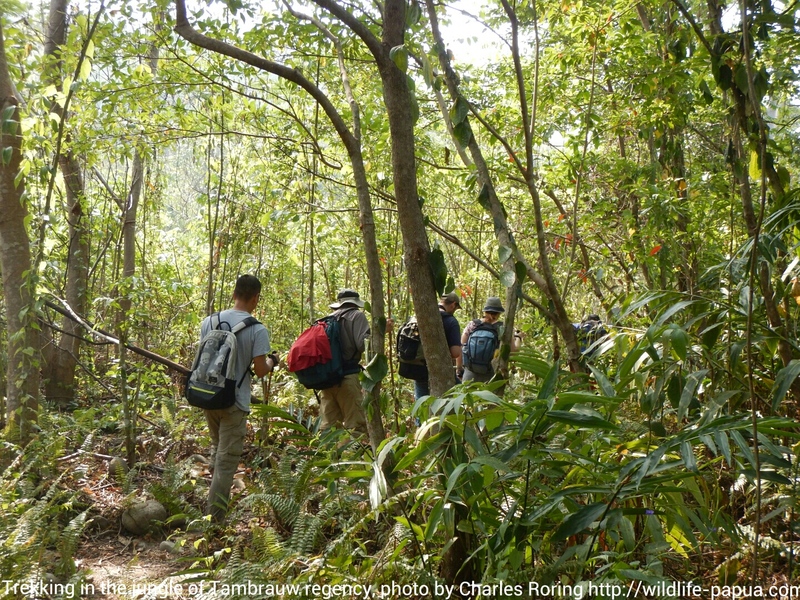 Hiking cannot be separated from birding because as we walk through the paths while exploring the forest, we will have more chance to watch birds. The best way to watch birds while hiking is along the banks of a river whose water is not deep. My recommendation is Cuan River. Don't forget to wear water shoes and a hat for your hiking and birding trip in Tambrauw regency. A good spotting spot is good for open space but a powerful bridge camera such as Nikon Coolpix P900 is recommended for avid birdwatchers. Please, look at the following map of West Papua. To participate in this birding tour, visitors have to fly from their country to Jakarta (the capital of Indonesia) and then continue by domestic airline to Sorong city which is the gate to Tambrauw regency. If you want to go birding in Tambrauw mountains, first, you need to fly from your country to Jakarta - the capital of Indonesia. Then continue your trip to Sorong city by one of the domestic airlines such as Garuda, Sriwijaya or Express Air. When you have arrived in Sorong city, I will meet you at the airport or at the hotel to arrange your trip to Tambrauw regency. To minimize the cost of transportation and other logistical expenses, I suggest that Birdwatchers need totravel in a group of at least 4 people. Why? Because, the maximum capacity of the cabin of a 4WD car is only for four passengers. Make sure that you bring a good D-SLR or bridge camera such as Nikon Coolpix P900 with extra batteries, spotting scope, and the latest edition of Birds of New Guinea (book). Sausapor (formerly known as Sansapor) used to be a base for US troops during World War II. As of today, people can still see some tank wrecks in the jungle left by the American troops. Between November and March, the coastal area of Tambrauw regency is an ideal place for wave surfing. Tambrauw has got several world class surf spots that have never been visited by surfers. 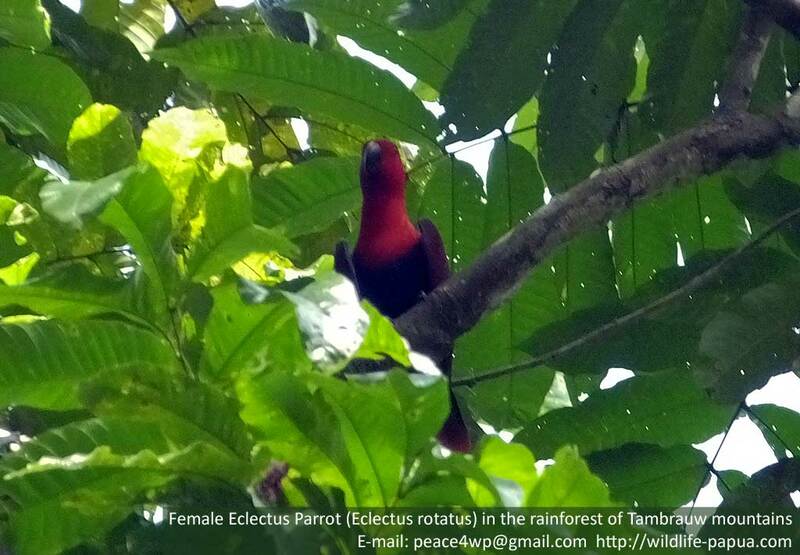 To book your birding tour in Tambrauw regency, please, contact me (Charles Roring) by email to: peace4wp@gmail.com. The birding tour is available all year round.